If you have been keeping up with this blogsite at all, you know that Michael Burns has become one of my heroes. I have repeatedly urged everyone who claims to be a Christian to read his amazing book, “Crossing the Line: Culture, Race and Kingdom” – published by Illumination Publishers (ipibooks.com). I have posted at least one of his articles on my blogsite, plus quoted from him fairly extensively in several of my own blog articles. Today, I have posted another of his articles, one entitled, “Conversations That Can Unite or Divide Us” (Blog 37). The title encapsulates the focus of the article. His grasp of all aspects of racial issues is astute and his ability to exegete Scriptures is to me quite captivating. 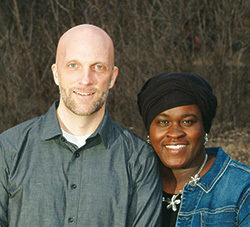 Michael is a full-time Bible teacher on the staff of the Minneapolis-St. Paul Church of Christ. He is a graduate of Wesley Seminary of Indiana Wesleyan University (MA). In my opinion, he is one of the finest teachers among us. He taught high school history in the central city of Milwaukee for nearly ten years. He is a national and international biblical teacher at churches and workshops. He is the founder and director of the Ministry Development and Training Academies centered in Minneapolis, Minnesota, and serves as an instructor in the Ministry Training Academies in Africa. He is the author of the C.O.R.E. series of books, which he uses in his training. There are seven volumes in this series, each of which numbers around 200 pages in length. Not too many people are aware of this wealth of material, so I’ll give you the titles of each of the books (also available from IPI). He married his wife, MyCresha, in 1997. They have two sons and reside in Roseville, Minnesota. They have done over 40 “Crossing the Line” workshops and teaching days on race and culture on multiple continents. As mentioned above, he takes annual teaching trips to Africa to strengthen and educate the churches across the continent and helps direct and teach in the African Ministry Training Academies in Lagos, Nairobi, Abidjan, and Johannesburg. Although Michael has not been as well-known as some teachers in our movement of churches, those days are quickly drawing to an end – as well they should. What he brings to the table is broad in subject matter and quite impressive in insightful depth. Plus, he is remarkably humble – a combination that makes him unique and a kingdom treasure. Now just read the following article that he authored! Thank you!